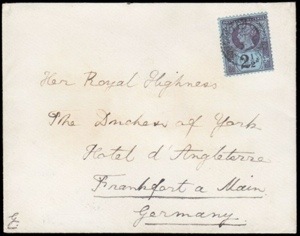 Anyway, I will recommence with this envelope sent from Prince George, Duke of York (future King George V) to his wife “Her Royal Highness The Duchess of York” in Germany and initialled at the lower left. Andrew Lajer is asking £350 which seems reasonable to me considering the desirability of Royalty philatelic items. Next up is this attractive and scarce imperf. plate proof of the 3d purple on yellow. I think it’s a snip at £100. For sale by Elstree Stamps on eBay. 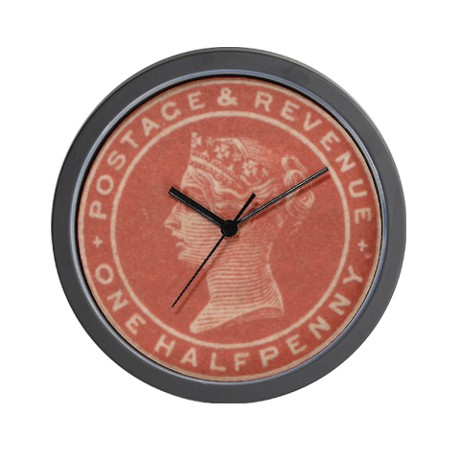 And now, the pièce de résistance of any Jubilee collector’s den: a clock with the 1/2d vermilion!!!! Currently on sale by cafepress.com for a bargain £14 plus postage. As I write this I’m looking at mine hanging proudly on the wall :-). They also have a huge range of printed t-shirts, hoodies, etc. for all stamp collectors. 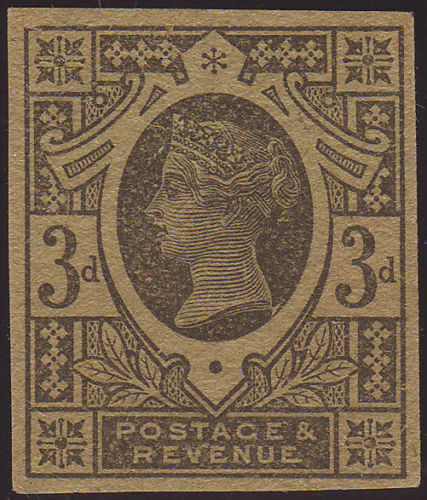 The 3d plate proof sold for a reduced price of £79.60. Bargain!